Whether you are a professional contractor, part time handyman, or do it yourselfer improving your own home, a self-leveling line laser is a great tool to have. These tools take the hassle out of having to constantly ensure your work is level. From tiling a bathroom to installing drywall in a large area, three beam lasers provide accuracy with precision 360-degree leveling coverage in both horizontal and vertical positions without having to change or move the tool. 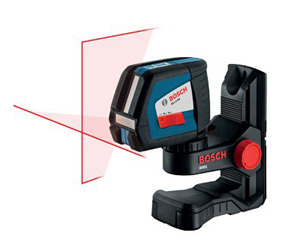 The following review examines the three beam laser leveling tools developed by two of the industry’s most renowned tool companies Bosch and DeWalt. 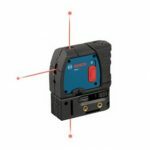 This laser level provides a three beam laser set to project a red laser beam line in a 90-degree layout. The bright diode is set to provide high visibility in bright working conditions. A magnetic pivoting bracket is built into the tool so you can mount the laser to a metal surface. The level is accurate to 1/8” either way at an elevation of up to 30 feet. 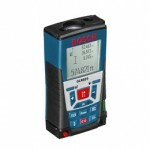 The level is easy to use with a single button operation and easy to read control panel. 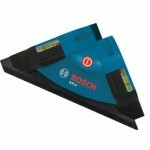 The level displays lines for both horizontal and vertical leveling at once. The level weighs in at only 4.6 pounds and comes with the four AA batteries required and has a battery life of 30 hours. 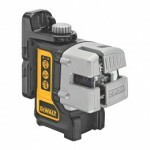 The level comes with a standard 3 year manufacturer’s warranty from DeWalt. Depending on where you purchase the level you may be able to purchase an additional warranty through the retailer. Spare parts are available through DeWalt such as the roll cage, battery door, screws, nameplate, wall mount, and storage box. 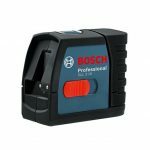 The Bosch GL3-80 provides similar features to the DeWalt DW089K in where it provides vertical and horizontal leveling and has a freestanding base with magnets and an option to mount it to a tripod. The design differs in where the Bosch level has a turret mounted on the top which provides the three-plane leveling beam on the top and two turrets on the side to project the 90 degree vertical leveling compared to the DeWalt which only has two turrets to form the 90 degree intersecting lines. The GLL3-80 has an optional laser receiver, LR2, which can be used to project a beam up to 265 feet in bright light. This laser also has a smart pendulum level method with an indicator of a non-level condition. The laser is rated at IP54 so it is water and dust proof to a certain extent which gives it a long life. The magnets on its base can attach to a metal track like the DeWalt level. The keypad has an easy to read display, pulse mode, manual mode, and plan selection buttons as well as a low battery indicator. This laser includes four AA batteries, a carrying case, instructions, and wall mount. The recommended tripod is a Bosch BS 150 camera type tripod sold separately. Overall, both lasers had equal pros and cons. The largest consideration for purchasing either product appears to be the price. Depending on preference for brand, you may elect to stick with the brand you know and trust. 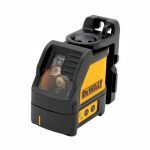 If you are brand neutral and are in the market for a three plane laser level you may choose to base your decision on price and frequency of use. If you don’t have the need for using one of these products very often you may want to consider the cheaper of the two. If you need to use a three plane laser level for multiple jobs at various locations the GLL3-80 may be the best fit due to the water and dust proof features it has over the DW089K. Click here to purchase GLL3-80 on Amazon!